Apple updates MacBook Pro with faster performance and new features for pros<br/>Now Featuring Up to 6-Core Processors and 32GB of Memory, True Tone Display and the Apple T2 Chip<br/>Cupertino, California — Apple today updated MacBook Pro with faster performance and new pro features, making it the most advanced Mac notebook ever. The new MacBook Pro models with Touch Bar feature 8th-generation Intel Core processors, with 6-core on the 15-inch model for up to 70 percent faster performance and quad-core on the 13-inch model for up to two times faster performance — ideal for manipulating large data sets, performing complex simulations, creating multi-track audio projects or doing advanced image processing or film editing. <br/>Already the most popular notebook for developers around the world, the new MacBook Pro can compile code faster and run multiple virtual machines and test environments easier than before. Additional updates include support for up to 32GB of memory, a True Tone display and an improved third-generation keyboard for quieter typing. And with its powerful Radeon Pro graphics, large Force Touch trackpad, revolutionary Touch Bar and Touch ID, dynamic stereo speakers, quiet Apple-designed cooling system and Thunderbolt 3 for data transfer, charging and connecting up to two 5K displays or four external GPUs, it’s the ultimate pro notebook. <br/>The new MacBook Pro is now faster and more powerful, with 8th-generation 6-core Intel Core processors on the 15-inch MacBook Pro for up to 70 percent faster performance and 8th-generation quad-core Intel Core processors on the 13-inch model for performance that’s up to twice as fast.<sup>1</sup> With the option to add up to 32GB of memory on the 15-inch MacBook Pro, users can run more apps simultaneously or load larger files into memory. And with up to a 2TB SSD on the 13-inch model and up to a 4TB SSD on the 15-inch, MacBook Pro gives customers the flexibility to work with large asset libraries and projects wherever they go. <br/>With 500 nits of brightness and support for the P3 wide color gamut, the Retina display on MacBook Pro is the best Mac notebook display ever. Now with True Tone technology, the display and Touch Bar deliver a more natural viewing experience for design and editing workflows, as well as everyday tasks like browsing the web and writing email. <br/>Also new to MacBook Pro is the Apple T2 chip, first introduced in iMac Pro. With the Apple T2 chip, MacBook Pro now delivers enhanced system security with support for secure boot and on-the-fly encrypted storage, and also brings “Hey Siri” to the Mac for the first time. <br/>The new MacBook Pro is also part of Apple’s <a href="https://www.apple.com/us-hed/shop/back-to-school" target="_blank">Back to School promotion</a> starting today and available to college students, their parents, faculty and staff through the Apple Education Store. The promotion includes a pair of qualifying Beats headphones with the purchase of any eligible Mac or iPad Pro for college, as well as education pricing on Mac, iPad Pro, AppleCare, select accessories and more. <br/>First introduced with MacBook, Apple leather sleeves are now available for the 13-inch and 15-inch MacBook Pro in Saddle Brown, Midnight Blue and, for the first time, Black. Designed with high-quality leather and a soft microfiber lining for extra protection, the sleeves are a perfect complement to MacBook Pro for users on the go. <br/>This fall, MacBook Pro can be updated with <a href="https://www.apple.com/newsroom/2018/06/apple-introduces-macos-mojave/" target="_blank">macOS Mojave</a>, the latest version of the world’s most advanced desktop operating system, with new features inspired by pros but designed for everyone. In macOS Mojave, a new Dark Mode transforms the desktop with a dramatic new look that puts the focus on user content. The new Stacks feature organizes messy desktops by automatically stacking files into neat groups. Familiar iOS apps, including News, Stocks, Voice Memos and Home, are now available on the Mac for the first time. FaceTime now adds support for group calling, and the Mac App Store gets a full redesign featuring rich editorial content and the addition of apps from top developers, including Microsoft and Adobe. 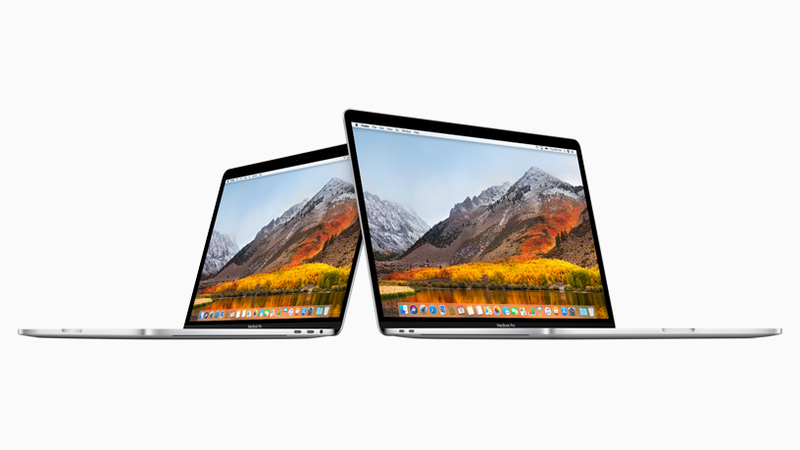 <br/>Starting at $1,799 and $2,399 respectively, the updated 13-inch MacBook Pro models with Touch Bar and 15-inch MacBook Pro models with Touch Bar are available today through <a href="https://www.apple.com/" target="_blank">apple.com</a> and in select Apple retail stores and Apple Authorized Resellers later this week. Additional technical specifications, configure-to-order options and accessories are available online at <a href="https://www.apple.com/mac/" target="_blank">apple.com/mac</a>.